It's that time of year again. The icy mornings where your breath billows out in front of you in fluffy clouds, your favourite Christmas cups are back - even though it's not quite December yet - and the leaves on the trees going through a magical metamorphosis of glorious reds, yellows and oranges. I'm not the most colourful of people, but this time of the year inspires me to incorporate a little autumnal splash of colour into my wardrobe. 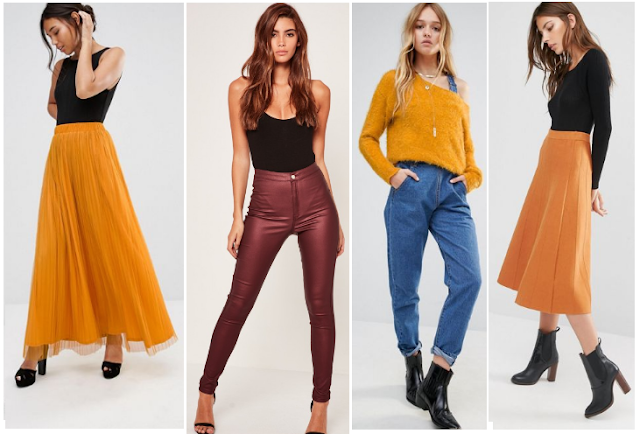 Be is mustard, rust, tobacco or burnt orange. Imagine twirling in the leaves with this skirt... oh this skirt was made for twirling. The jeans however a little more on the vampy side - perfect for wintery nights out where you can't fathom wearing a skirt or dress. The jumper looks super cosy for the chilly mornings and evenings dawning in on us now. And another skirt. A little more structured this one, which wouldn't look out of place worn in the office or for client meetings. These trousers... because camel <3 Aren't they so much more interesting than standard black or blue jeans?! However this burnt orange blouse would make any pair of blue / black jeans extra special. I don't own anything yellow, but this coat would help lift the darkest of outfits. 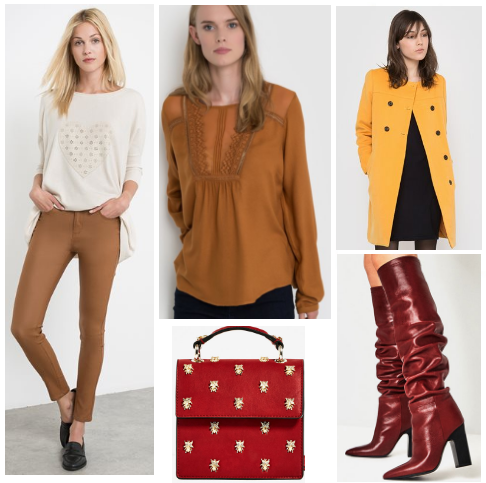 And for rich reds, I love this bag with quirky detailing and this pair of knee high boots. What items are your favourites?